Sketch Plan for Eco Climate Village by Ir.T.Kukuh S.
Coastal and islet villages around Dompu, West, Nusa Tenggara (Lesser Sunda Islands), Indonesia have demonstrated a high vulnerability to climate change impacts, and thus were considered high priority case studies to consider as pilot sites for this eco-climate village project. A multi-aspect approach which took into account environmental and socio-economic factos was utilised for choosing the specific sites. The Jambianom hamlet was chosen as a case study, and the youth took a leading role in the project by rallying the community and acting as focal points for communication with experts and government officers/bodies. 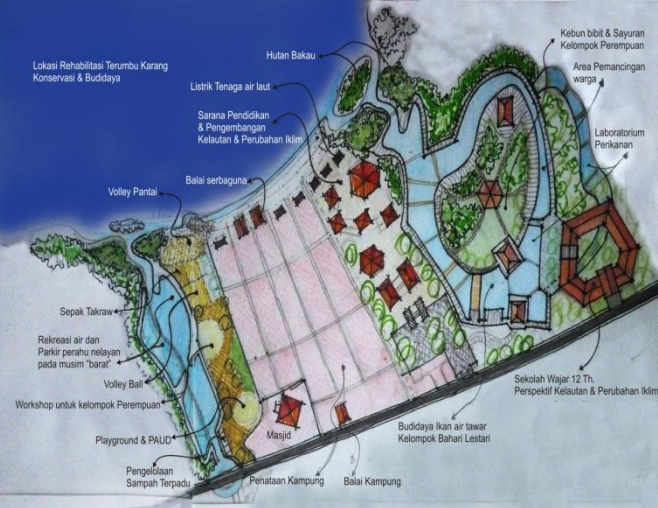 The Eco-climate village model has been scaled up by incorporating aspects from the I-CATCH method (The Indonesia-Climate Adaptation Tools for Coastal Habitat) and PDPT (Resilient Coastal Village Development) from the National Ministry of Marine Fisheries for village scale climate change adaptation. The scaled-up model is called the 'Delta Api’ concept and covers three villages - two located in the main land and one located on an islet. Training sessions with younger generations were conducted to build capacity and to prepare them to take a leading role in the project. The 'Delta Api’ can also be scaled up in other regions, especially in the islets area in Indonesia. The next test area will be the North Moluccas province. In preparation for this, a youth leadership training workshop was conducted in Ternate city in December. Delta Api was also implemented in a North Lombok District in January 2013 and lasted for six months.